On Friday December 21st, the Morgan Hill Police Department will be taking delivery of its new public safety command vehicle. In 2016, the Morgan Hill Police department began the process to apply for two grants to fund the purchase of a mobile command vehicle. The South County command vehicle project was accepted and funded in two grant cycles through the State Homeland Security Grant Program (SHSGP) – a Federal grant program where monies pass through the state to fund projects selected at the local level. The Morgan Hill City Council accepted the grant and the command vehicle was ordered through LDV in July of 2018. 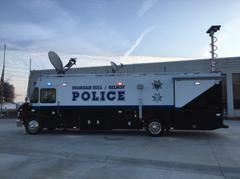 Although the command vehicle project is a regional asset, the City of Morgan Hill took the lead role in its acquisition. Emergency events, such as wildland/ urban fires, floods, earthquakes and other large-scale events require a multi-agency response that can include mutual-aid from fire, police, sheriff and state and federal emergency groups. 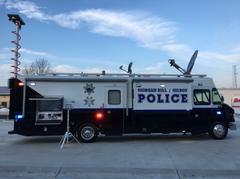 The public safety command vehicle will provide the south county residents with a rapid response to such events and provide the incident commander with the tools needed for communication, coordination and control of an emergency. Additionally, the command vehicle will be utilized regionally during large public events such as the Taste of Morgan Hill, Mushroom Mardi-Gras and the Gilroy Garlic Festival to provide public safety support and communications. “Our success in the grant process would not have occurred without the work of Captain Shane Palsgrove. He shepherded this project from Council acceptance through project delivery. We would not have it here on Friday without his leadership,” said Chief David Swing. The vehicle will enhance interoperability for police/fire/medical first responders enabling them to quickly provide required information to the Emergency Operations Center during any type of crisis. This will also bridge any communication gaps to effectively communicate with other command vehicles in the Bay Area such as those in Sunnyvale, Mountain View and Palo Alto. The vehicle will provide a mobile platform for the Command Staff to stage, plan and implement specific actions to quickly resolve incidents. “This vehicle will improve our disaster response, recovery and resiliency for generations to come. We are grateful to the Department of Homeland Security for the funding and the Santa Clara County Approval Authority for the local allocation. Residents of South Santa Clara County will benefit from a more coordinated all-hazard response because of their investment, said Chief David Swing.